Tim Burton is well known for directing unusual movies that don’t follow the well beaten paths. If you are a fan of his work, this movie will not disappoint. Based on the 2011 novel of the same name by Ranson Riggs, the screenplay written by Jane Goldman captures the elements from the young adult book which was a story woven around old photographs. Burton’s movies are filled with interesting visuals, set decorations and fantastical elements that will keep one glued to the screen. The story which is sort of Harry Potter and the X-Men with time travel stands on it’s own, but may be scary for small children. Jake (Asa Butterfiled), a 16 year old American teenager, had an awkward childhood of never quite fitting in. He is close to his grandfather, Abe (Terence Stamp) who would tell him of his childhood in an orphanage and the peculiar children who lived there. One day his grandfather calls him saying he is not safe. The tragedy that follows leads Jake to see this monstrous creature. His parents take him to a psychiatrist (Allison Janney) who encourages him to visit his grandfather’s home in Wales so he can have some closure. His father Franklin (Chris O’Dowd) had a troubled relationship with Abe, and hopes that Jake will realize his grandfather was just filling his head with stories and go back to being a normal teenager. Except their trip to the small town on a Welsh island takes an extraordinary turn. The Victorian orphanage of his grandfather turns out to be a bombed out ruin destroyed on September 3, 1943. He goes back again, only to see some children, and runs after them, knocking himself out in the process. When he awakes he’s at the orphanage, but it’s 1943 and everything is restored. He meets Miss Peregrine (Eva Green) the headmistress with the ability to transform into a peregrine falcon and manipulate time. As well as an assortment of children who Jake immediately recognizes from his grandfather’s stories. Jake learns the monster who killed his grandfather is a Hollow, a creature that is used by the Wights, undead humans that hunt and kill peculiars for their abilities. Lead by Mr. Barron (Samuel L. Jackson), an eyeball eating mad scientist, they experiment on Ymbrynes who can change into one kind of bird and create and maintain a time loop. The Wights are trying to find a way to become immortal. The Ymbrynes hide in their time loops from the Wights and Hollows, but there is word that some time loops are being destroyed and the children are gone. 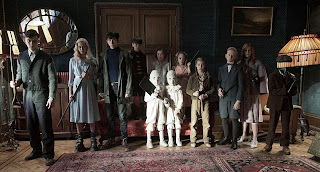 When Miss Peregrine is captured by the Wights, Jake must use the peculiarity that he inherited by his grandfather, to help right the world. 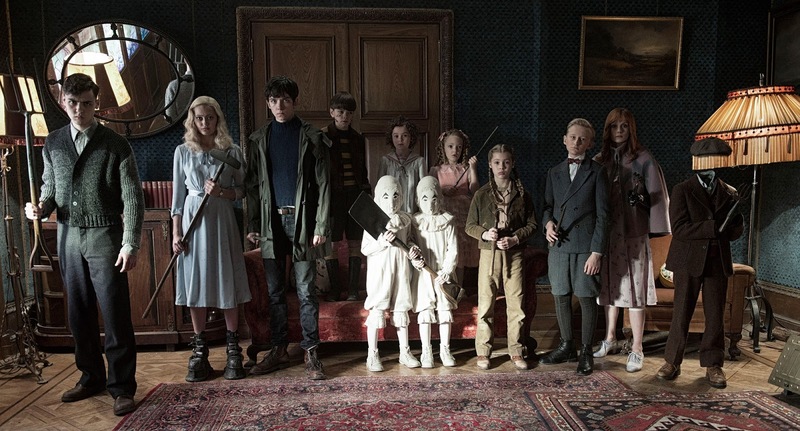 The story is unveiled from Jake’s standpoint, so the viewer discovers that peculiar children through his eyes. Each are unique in their abilities, and welcome Jake who reminds them of his grandfather who had lived with them at one time. There’s an invisible boy, a small girl with a mouth behind her head, a preteen that grow and control plants, a boy who can resurrect dead for short times, a kid with a beehive in his stomach, a boy with prophetic dreams, a pyrokinetic teen, and inhumanly strong child, and aerokinetic young woman who has to wear leaded shoes or be tethered so she can’t fly away. It’s really nice to see Tim Burton is back to his usual form with another movie that will stand repeated viewing. Want to see this movie. Any preview screenings in Dallas?